Getty/Stephanie KeithShoppers are buying things again. Retail has rebounded in the United States, according to a new report by Moody’s Investors Service. In a report released on Thursday, the financial services firm changed its outlook on the retail industry to “positive” for the next 12-18 months. A strong US economy, investment in e-commerce, and greater efficiencies are fuelling a better earnings outlook for retail companies. 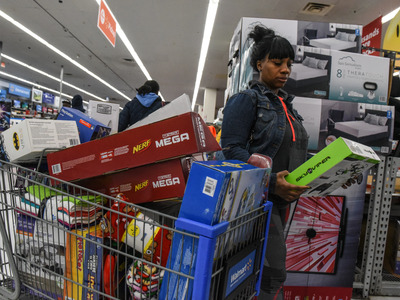 It’s the first time that Moody’s has raised its outlook above “stable” since the retail apocalypse was looming in 2015, signifying the worst is likely now behind retailers. A strong US economy, investment in e-commerce, and greater efficiencies – factors that all started coalescing last year – are fuelling a better earnings outlook for retail companies and have led to a turnaround for retailers’ fortunes. That means Moody’s expects mostly positive news from retailers for the next 12-18 months, based on improving business conditions that would affect all companies. “The positive outlook for the US retail industry reflects increasing topline growth and operating profits as companies’ investments to improve both the online and in-store shopping experience continue to gain traction,” Mickey Chadha, a vice president at Moody’s, said in a statement announcing the report. With high consumer confidence and low unemployment, many shoppers likely feel that they’re in a better place to spend a few more dollars than they might otherwise spend. This plays in stark contrast to the situation retailers have been in over the last several years, as the so-called “retail apocalypse” has devastated retailers’ profits and forced some to close stores or file fo bankruptcy. Moody’s now projects 4.5%-5.5% sales growth for the year, up from the 3.5%-4.5% the firm predicted in July 2017. Online shopping is still outpacing overall retail growth. Moody’s is projecting e-commerce to grow from 15% of the pie currently to 20% in about five years. It’s not all good news for retailers: a tight labour market means retailers will need to pay more for good employees. Freight costs – especially stemming from a shortage of truck drivers – are another ongoing concern. Despite improving fortunes for the industry broadly, some retailers, like Sears, still aren’t faring well. Cowen predicts that more store and malls will close in the US as retail space contracts and sales move online.